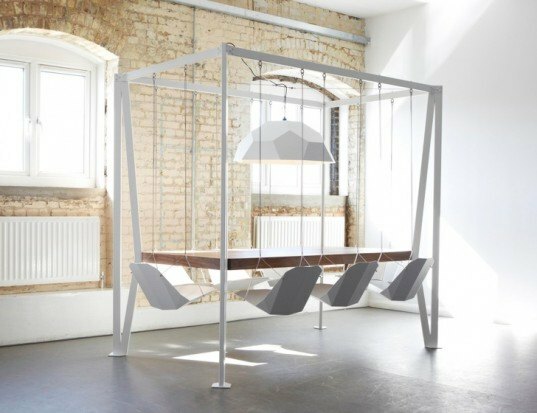 DuffyLondon’s sweet Swing Table turns even the most boring board meeting or an everyday meal into a fun affair – guests can swing and sway while starting their first course or discussing the latest hot topic. And best of all? The modular stand-alone unit can be set up in any room without construction of any kind. Three geometric chairs swing on each side of the long table, and two more cap the ends. Since it doesn’t have any chair legs the Swing Table is also a host’s dream – there’s no obstacles for a mop of vacuum to crash into during cleanup! A matching geometric pendant lamp hangs over the table’s surface, making it an almost entirely self-contained unit. The design can easily be moved as one piece, instead of lugging each chair across the room. We love how the Swing Table adds an element of play to dinners and meetings – each chair floats independently, so guests can sway at their own pace while enjoying the company of others. 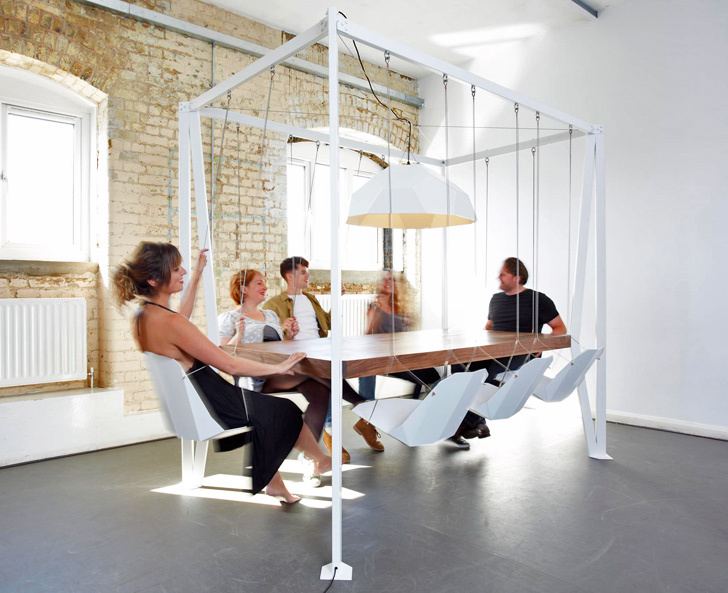 DuffyLondon’s sweet Swing Table turns even the most boring board meeting or an everyday meal into a fun affair - guests can swing and sway while starting their first course or discussing the latest hot topic. And best of all? The modular stand-alone unit can be set up in any room without construction of any kind.